"Before consumers buy a product, they must be captivated by its story. Trends help make stories powerful, believable, and on-brand." She helps brands and businesses anticipate trends and use them to develop products that inspire, tell a story, and ultimately, sell. First and foremost, Gudy considers herself a visual creative passionate about scouting trends in interior design & lifestyle. With a sharp eye honed by years of hands-on experience in international retail management, she observe trends as they emerge. Trend development requires a keen esthetic sense and the ability to pick up on early signs before they grow into global movements. Working creatively to bring images, color, and materials together, these visual cues are developed into trends. From a vast sea of information, abstract trends are transformed into seasonal trend reports and key visuals. Clients receive expert guidance at every step of the design and product development process, from concept to shop floor. The result: powerful, story-driven collections that give brands a distinct advantage in today’s fast-changing retail landscape. but how you filter and act upon it makes all the difference." Through trend lectures of 45-60min., industry decision-makers benefit from sharing trend knowledge at international design events such as the imm Cologne, BAU Munich, and Interior øg Boligmessa in Norway or Barcelona Design Week. Trend Lectures can be booked for design events, trade shows and in-house conferences. Trend videos, brochures and catalogs help deliver trend information from distribution and retail departments, right down to the sales floor. They can be developed for B2B or B2C channels. Best for: product development directors, designers, purchasing and marketing departments. The Trend Think Tank comes together twice a year to discuss trend directions 24 month ahead. 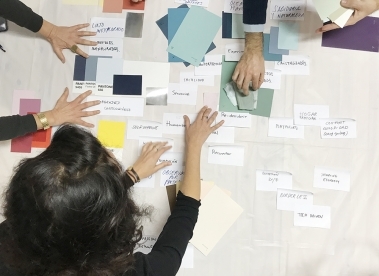 A team of experts covering industries such as interior design, food, innovation, technology, textiles, fashion and beauty work during a computer-free session on materials, images, color to bring One Big Idea together. As a result, several digital trend reports are published throughout the year. You can expect to see published 4 new Trend Books in 2019. IKEA, Montblanc, European Institute of Design (IED), Grohe, Samsung, Kibuc, imm Cologne, BOEN, Farrow&Ball, Finsa, Grupo Pikolinos, Cosentino, Barcelona Design Week, Callwey, Bisetti, Decotec, and hundreds of very inspiring & creative professionals from all over the world who fly in to attend the masterclass which takes place a few times per year.